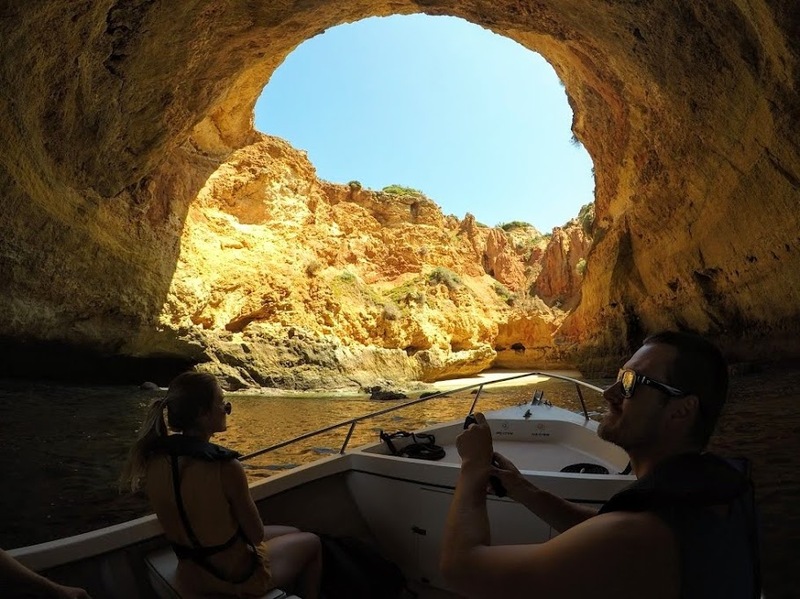 Benagil Cave & Algarve's Coastline Boat Tour: What A Day! 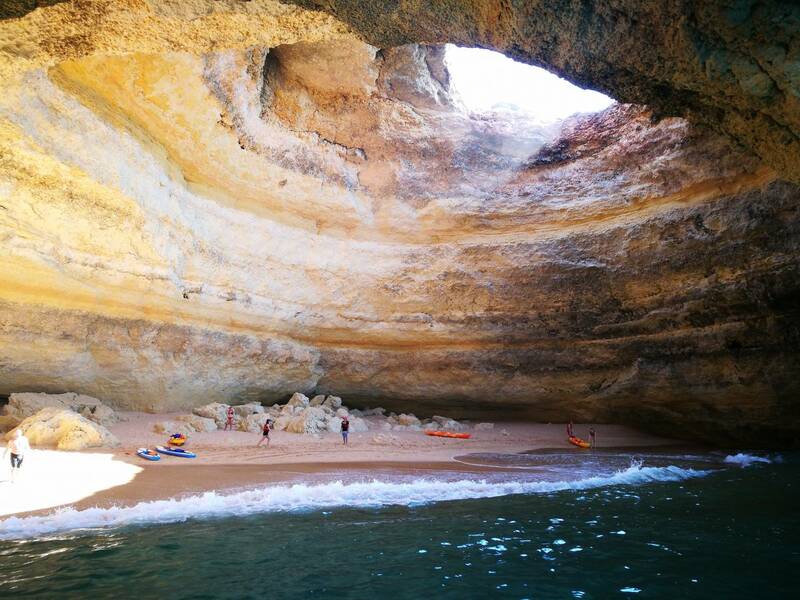 Benagil Cave & Algarve’s Coastline Boat Tour: What A Day! The Algarve is the best spot Europe has to offer for a summer vacation. This is a fact! The amazing beaches and mystical sea caves are making the southern Portugal famous. (Like Praia da Marinha and the Benagil Cave). That's why we decided to take a boat trip along this fabulous coastline and all our expectations were exceeded! Check it out! Summer has never been so hot in Algarve. So the experitour.com team decided to have a taste on the Portuguese waters and reviewed one of our boat tours that sails along the golden coast. The boat left the city of Portimão and took us to see all the beautiful caves and beaches until the fantastic Benagil cave. We spent great two and a half hours in the guidance of Bruno. The super nice guy that also happens to be our skipper and bilingual guide! Our guide, Bruno, in his everyday office. Our boat tour started from Portimão, western Algarve, and navigated until Praia da Marinha. According to CNN’s guide of beaches for 2018, Praia da Marinha is one of the most beautiful beaches in the world! Our boat tour leaving Portimão, passing through Ferragudo. Bruno explains the history of the Algarve as our boat passes by old castles by the sea, tells the name of each beach and says hi to every other boat touring the coast. The sympathy of the Portuguese people! From Portimão, our small boat visited a lot of sea caves! The coast in the Algarve is practically made of golden cliffs, with beaches among them and the sea kissing the sand. An amazing picture of blue and orange! Probably in Paradise Cave, but there were so many caves this beautiful and they were all a piece of heaven. We went inside the caves! One more surreal than the other, each with different drawings and shapes. The sea caves we visited were created naturally, because of the movements from the waves. Also, the many earthquakes and tectonic deviations caused the unique setting to be like what we see today. The Algarve is a gift for Portugal. Finally, one of the most expected stops for every traveler in the Algarve: The Benagil Cave! The Benagil cave, that looks even more impressive in person! A must-see before you die! Even for some of us that had seen the Benagil before, the cave still impresses. The great grotto that has an open top and a real beach inside, is Algarve’s hottest spot! Until a few years ago, the Benagil cave was only known by a few locals, and now the whole world wants to visit it. On this tour, we got to see it real close. One of the highlights of this tour is that you get to see the best things Algarve’s coast has to offer in just two hours! Bruno also tells you secret tips that only local people know, as what beaches are less crowded in the summer and how to access the most beautiful desert beaches on foot. Take a look at this great video we did from this tour! Being completely honest: this was one of the best tours we did in the Algarve! The sun was shining, the sea was calm, and the photos were perfect! The guide was very attentive and the boat was nice and safe. We recommend this boat trip to anyone looking to see the Algarve, visitor or local! You will discover many grottos and love Portugal even more! What are you waiting for? Click here to access the tour’s page and book your trip! algarvebeachbenagilpraia da marinhasea cavesummer Post written by Letícia Melo.